Choose from a broad range of colours. If you can think it, we can paint it. Add a bit of depth to your splashback with one of our metallics. Make a splash by adding sparkles to your splashback. Let your imagination free! Have your favourite picture printed right on your splashback. Nothing opens up a room quite like a big mirror. Let us open up your room. Hello, do you want to make a splash in your home, office or boat. Think glass. The exciting and effective medium to make your personal statement about your lifestyle. Contact us at Splash of Glass to achieve your dreams. There is an extensive palette of colours and finishes to allow your imagination free reign to complete your project in your unique style. See our gallery of actual clients projects taken by us not at photo shoots. From metallic to mirrors, or even your favourite photo: the choice is almost as wide as your dreams. All our painted and printed splash backs are made from Optiwhite™ glass this makes the colour you choose virtually unaffected when looking through it. Also all our painted and printed splash backs are toughened glass which makes them 5 times stronger than standard glass with the benefit of being heat resistant, and when any sockets are being tightened back the glass will not break or crack under reasonable load. Why contact us? Because we will be delighted to bring all of this together to create the “look” you want. Servicing the whole of England and Wales, don’t let your location deter you from having the kitchen of your dreams! There is an extensive palette of colours and finishes for what ever your imagination can create. We have our standard range to help speed up the process but virtually any splash of colour is available as we use a Dulux™ paint colour system. We can also add rainbow sparkle effect to any flat colour to help catch the eye. See our gallery for examples. From flat colours, metallic, sparkle to mirrors, even your favourite photo – making the choice is almost as wide as your dreams. With flat colours your choice is literally unlimited, we use a Dulux™ paint mixing machine so every colour is available, and as the glass is optiwhite™ there is hardly any change when it is behind the glass. Either way we would send out a sample to you for a small fee, if required, to confirm before we go into production. Or alternatively choose a colour from our standard range. Matt finishes of all the colours are also available by having the surface of the glass frosted, this has the effect of making the glass softer looking. We do not recommend matt finish in a kitchen or bathroom as they are more prone to marking and are less easy to clean. We have a range of metallic colours which add hidden depth to the project and provide a neutral background for any accessories you wish to display. These provide a fantastic colour or shade during the day but really come alive under lighting or at night as you move through the room. In particular the rainbow sparkle can be added to any flat colour to increase its presence and catch the eye of unsuspecting visitors. Our mirrors come in three shades: Normal Silver Mirror, Bronze Mirror & Grey Mirror none of which are toughened glass. The coloured mirror can add a real depth of room. Silver mirror is available up to 3900mm long and both bronze and grey mirror 3200mm long. Toughened Antique finished mirror is also available, and is available in three finishes. Antique, Special Antique & Heavy Sparkle Antique. These are unique individual finish and are not a consistent pattern. Prices on request. Measure one panel at a time. Click on the button below to download a template for measuring up your space. Dimensions for square panels with no cut-outs. Once we have received the deposit the glass on average takes about 10 working days to be delivered, this includes water cutting where required, polishing edges, toughening, cleaning painting or printing, kiln drying wrapping and shipping. If you are finding the idea of measuring yourself in any way “off putting”, we offer a comprehensive templating and fitting service, where we take on all the responsibility of getting the project right for you. We can even help you with getting as accurate quote as possible via photos of your project. When we take on the full project we would bring our samples with us and guide you through the complete process including using laser light to create perfect datum lines for us to take measurements from. Prices for templating and fitting are banded on area so please include your project postcode when asking for a quote. For templated and fitted projects £150 non refundable deposit is required before templating, on completion of templating the balance of the deposit will be required this being 75% of the project less £150 already paid. Leaving the 25% outstanding which becomes due on completion. 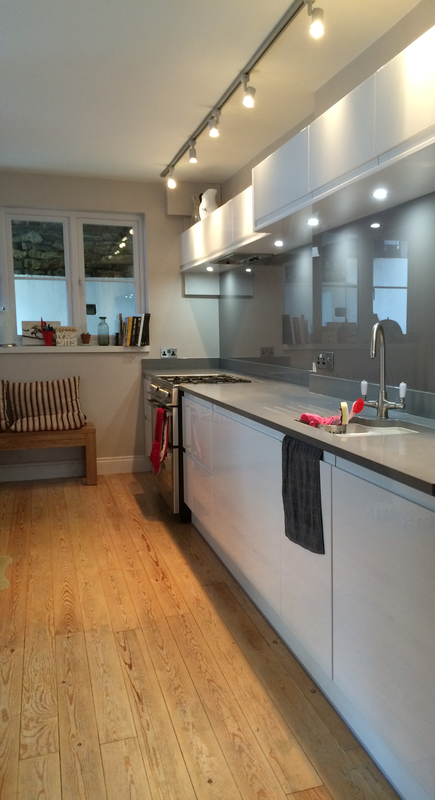 Why choose A Splash of Glass for your glass splashback?